For the second night in a row, the Cleveland Indians blocked the Chicago Cubs bid for their first World Series game win at home since October 8, 1945, beating the Baby Bruins 7-2. Neither the ebullient Wrigley Field crowd, the sentimental notion that the Chicago franchise would make history, or even the distinctly unfriendly confines of the cozy visitors’ clubhouse (which will not be renovated until 2018) seemed to phase the Indians. 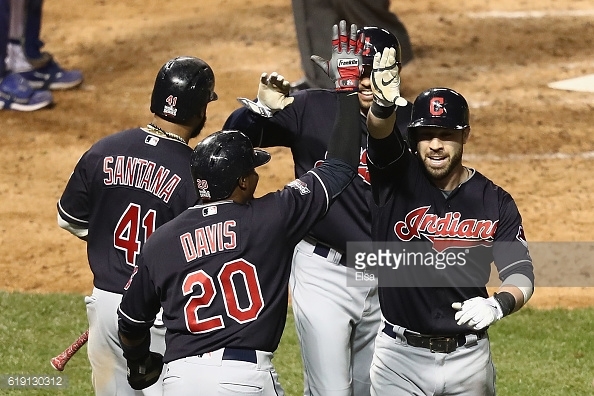 Cleveland holds a 3-1 series lead and is now on the brink of its first World Series title since 1948. The American League title holders beat up the National League champs; out-hit them ten to seven; out-slugged them, four extra base hits (two homers) to two (both by Dexter Fowler); played errorless ball in contrast to two Cubbies miscues (both charged to Kris Bryant); and coaxed superior pitching from starter Corey Kluber, if not the complete dominance he displayed in Game 1. The Cubs began play Saturday already licking their wounds. They had won one of three against the Indians but had managed only a .202 team batting average in the World Series; their percentage of success fell below .200 with runners on base. After Kluber and company blanked the Cubs 6-0 in Game 1 and Josh Tomlin and Indians relievers spoiled the Wrigley Field World Series opener 1-0 in Friday’s Game 3, the relief was palpable when Anthony Rizzo singled home Dexter Fowler in the bottom of the first. The host Cubs led 1-0. The Indians wasted no time striking back. In the top of the second, Carlos Santana smashed a ball several rows into the right field stands off Cubs starter John Lackey. The veteran right-hander threw a decent pitch but it caught perhaps too much of the outside half of the plate, and Santana was able to extend his arms on the swing. A Kris Bryant error prolonged the inning. The sophomore Cubs star made a nifty spin move to field a ground ball to his left but he air-mailed the throw past Anthony Rizzo. A Tyler Naquin intentional pass later, Kluber stepped up to the plate. In one of baseball’s cruel twists, he followed up a scorching line drive foul with a swinging bunt on the infield grass, making Bryant charge in and make a barehand scoop. When Rizzo could not handle the late throw, Lonnie Chisenhall dashed home, making the score Indians 2, Cubs 1.
in Game Four of the 2016 World Series at Wrigley Field on October 29, 2016 in Chicago, Illinois. Jason Kipnis opened the third with a pinball shot into the right field corner for a double. Sophomore sensation Francisco Lindor followed with a frozen rope to right center that picked up Kipnis and extended the lead to 3-1. “Klubot,” as the steady Indians starter is known, pitched his way out of two-out trouble in the Cubs third. With Rizzo and Bryant on base, Kluber threw eight pitches to the Cubs best postseason batter, Ben Zobrist. The Cubs versatile infield-outfielder fouled off six straight pitches before succumbing to a well-placed breaking pitch. Chisenhall’s healthy fly to center field in the sixth scored Lindor from third, padding the Tribe’s lead to 4-1. As the game wore on it became apparent that Kluber had an advantage over the Cubs young hitters. He exploited their eagerness with runners on base by throwing a generous mix of breaking pitches – his slider and curve ball – outside the zone, expertly luring the less experienced Cubs batters into bad swings. The Indians rallied again to open the seventh. Pinch-hitter Coco Crisp doubled to center and advanced on a wild pitch; Justin Grimm then hit Rajai Davis. Joe Maddon called in left-handed workhorse Travis Wood to stop the rally, but to no avail. Jason Kipnis greeted Wood with a 3-run blast to right that probably gave the fans in the mid-right field bleachers a touch of deja vu, except Santana struck his blow to the right field seats without runners on base. Leading 7-1 going into the seventh, Indians skipper Terry Francona turned the knife by bringing in his closer Andrew Miller. In postseason, conventions go out the window and Francona’s move was calculated to break the Cubs while they were down. Preserve the win and he forces Chicago to win all of the next three games. Dexter Fowler was not bothered by Miller’s dominance and took the lanky left-hander deep to left in the eighth inning to make the score Indians 7, Cubs 2. The Cubs went rather quietly in the ninth with Dan Otero mopping up to preserve the five-run margin of victory. Next: Game Five, Sunday October 30th, 7:00 P.M. CT, Wrigley Field, Chicago. The game is the Cubs last chance to salvage a World Series game victory in the Friendly Confines, then face the specter of a series loss in Cleveland after Hallowe’en.